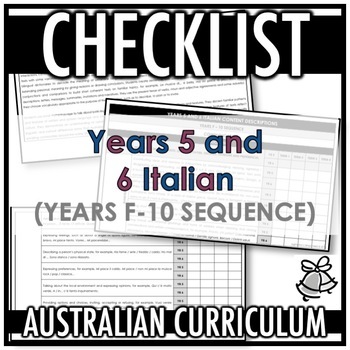 This CHECKLIST uses the Achievement Standard, Content Descriptions and Elaborations of the AUSTRALIAN CURRICULUM. This product has been created to enable you to plan effectively. PLEASE SEE THE PREVIEW OF THIS PRODUCT FOR A CLOSER LOOK. By leaving valuable feedback, you will receive TPT credits for future purchases. Click the GREEN STAR next to my name SIGNORINA CAMPANELLA at the top of the page to become a follower of my store. This product is designed for SINGLE CLASSROOM USE ONLY. This product cannot be shared without purchasing additional licenses from Teachers Pay Teachers. This product may not be copied, edited or resold in any form without permission from Signorina Campanella. © Australian Curriculum, Assessment and Reporting Authority (ACARA) 2010 to present, unless otherwise indicated. 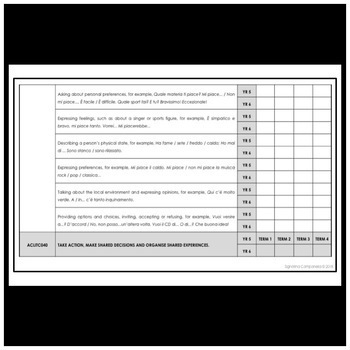 This material was downloaded from the Australian Curriculum website (www.australiancurriculum.edu.au) (accessed 15 April, 2019) and was modified. The material is licensed under CC BY 4.0 (https://creativecommons.org/licenses/by/4.0). Version updates are tracked in the 'Curriculum version history' section on the 'About the Australian Curriculum' page (http://australiancurriculum.edu.au/about-the-australian-curriculum/) of the Australian Curriculum website. ACARA does not endorse any product that uses the Australian Curriculum or make any representations as to the quality of such products. Any product that uses material published on this website should not be taken to be affiliated with ACARA or have the sponsorship or approval of ACARA. 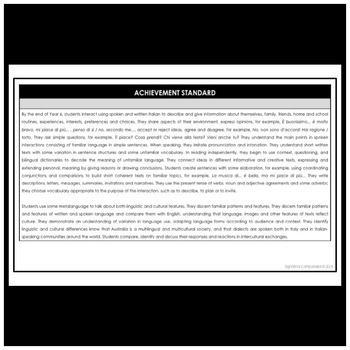 It is up to each person to make their own assessment of the product, taking into account matters including, but not limited to, the version number and the degree to which the materials align with the content descriptions and achievement standards (where relevant). Where there is a claim of alignment, it is important to check that the materials align with the content descriptions and achievement standards (endorsed by all education Ministers), not the elaborations (examples provided by ACARA).